But Altesse is even better. In 2015 she went through a full refit to specifically enhance the experience for charter guests, through additions such as full dining capability on the flybridge, enhancements to the interior to give her a sophisticated European twist and a custom built 'champagne deck' which extends the cockpit and offers a unique and hugely popular additional relaxation and jumping area. She also has a brand new 70HP dinghy, inclusive diving for up to five guests, all new water toys (including an 8 man floating island), new linen, crockery and furnishings throughout reflecting the refined taste of the French owner, not to mention a wine cellar including a range of superior French organic wine. 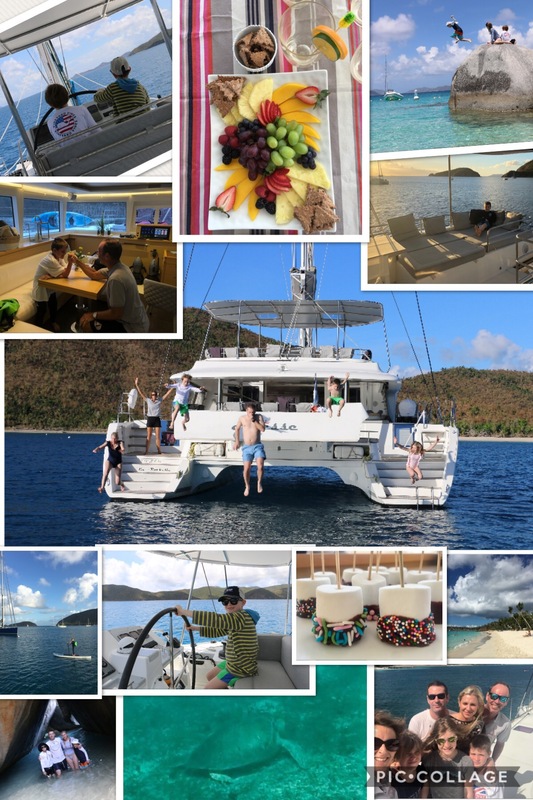 So whether you want activity and exhilaration, or rest and relaxation, Altesse and her award winning crew, who have been chartering in the BVI for 5 years, will ensure that you get everything you wished for and more. Altesse's custom-built "champagne lounging deck"
Enjoy ALTESSE's unique "Champagne Deck"
the aft cockpit with the "Champagne Deck"
Richard is an accomplished yacht captain, sailor and dive master. 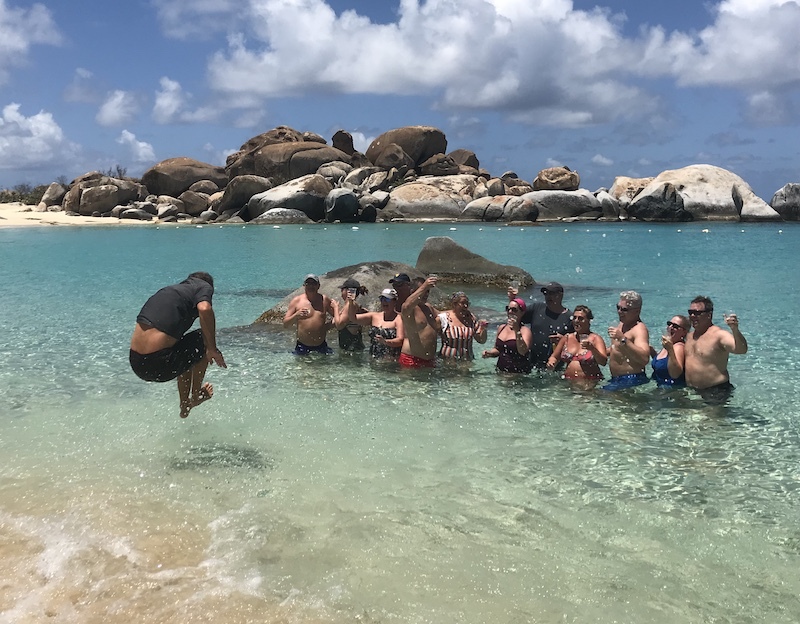 He has sailed extensively in the Mediterranean and Caribbean, but has developed an in-depth knowledge of the BVI, allowing him to adapt the charter to suit the guests on board and show them less frequented coves and bays as well as the hitting the top BVI spots at the best time of day. He has led more than 200 dives in the BVI and knows a large number of dive sites suitable for all levels of diver. Richard also competed internationally as a life guard, so always ensures everyone enjoys the water with the knowledge there is someone on hand to help if they feel ‘out of their depth’. 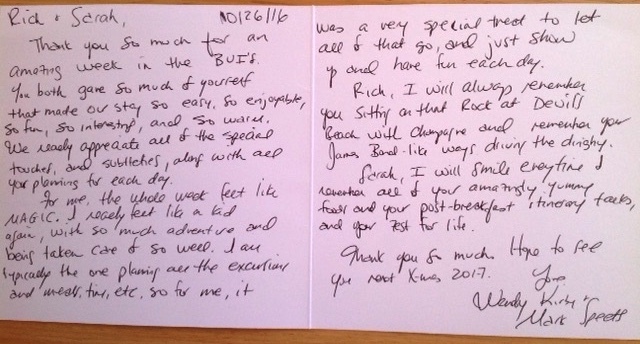 Richard loves sharing his passion for sailing, diving, nature and the water with guests, ensuring they get the very most out of their trip. Sarah is the epitome of the perfect First Mate and Chef. She has professional culinary training, but it is her passion and love of food that makes her the amazing chef that she is. 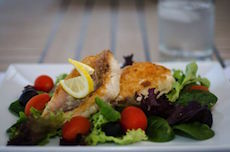 She loves nothing more than to cook food which people adore and is happiest when she is adapting her menu to suit the tastes of those on board. Like Richard, she is fantastic with people and makes everyone feel comfortable and at home. Her biggest motivation is finding the extra personal touches that turn a great vacation into an unforgettable experience. She is extremely energetic and enthusiastic, and loves the outdoors. Sarah is always up for an adventure, whether it's sailing, running with guests, hiking, diving or snorkelling. She is extremely neat and tidy, but as a qualified boat captain she also knows how to sail a boat and get her hands dirty when needed. We've had plenty of "Sarahnades" and "Richslaps" this week, which is exactly what keeps us coming back! We've seen gorgeous reefs, amazing animals, beautiful islands and miles and miles of turquoise waters. But the feature that will bring us back next year, after all this amazement, is the crew: Sarah and Rich. They made us feel simultaneously adventurous and at home. We will only sail with them and we will follow wherever they go! And if Sarah made a delivery food service, we would definitely subscribe! There are vacations you embark upon with good friends and there are those vacations where you make new friends. In the last seven days we have been shown some truly beautiful places, we've been treated to some insanely delicious meals and we now have two great friends in Richard and Sarah. Thank you for the hospitality, the kindness, the abundance of ice and, most importantly, not giving Simos a loaded staple gun! Thank you for the holiday of a lifetime. So many special moments and memories. I will never forget the moment we were surprised with bubbles at the Baths. Such delicious food - I will definitely take away some ideas, but am sure I won't ever be able to match up to your standards in the kids eyes! To bring our best friends and family to the BVI for my 60th was a dream event and you have surpassed my highest expectations on every level! 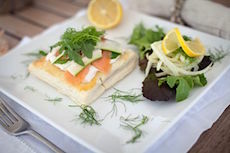 The perfect itinerary, gourmet food and expert guidance along the way, were all superlative. Thanks for calmly managing the logistics between boats and helping introduce newcomers to these amazing islands. And for making sure that our three teenagers had a brilliant time every day. 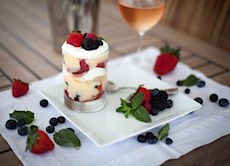 You are both professional and fun - the perfect hosts for the BVI. Deep gratitude from all of us. See you again very soon! Tom, Lois, Andrew, William and Ella. We got home and walked through our front door at five o’clock yesterday, and Alex turned to me and pointed out in a sad voice that it was captain’s cocktail hour. I did have a beer, but it was not even close to the same as being on Altesse . Nothing we could write would do this trip justice. Sarah and Richard went above and beyond to set this trip apart from others. Between the gourmet food, snorkeling, water sports, paddle board races and, our favorite, Captain's Cocktail Hour, we truly could not have asked for more. 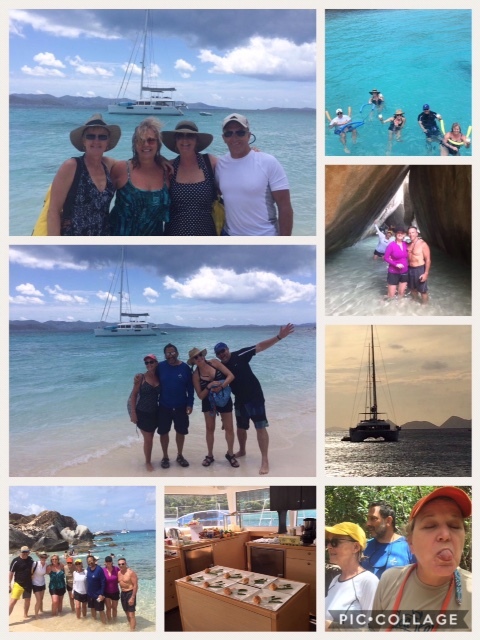 There is no better way to visit the BVI than with Sarah and Rich on Altesse. Thank your everything! This trip was a trip of a lifetime! I never dreamed how spectacular it would be. Your attention to detail and hospitality can't be beat! The food was amazing and the boat was impeccable! Thank you so much for celebrating our 40th Birthdays. Thank you for such Ana amazing week it was beyond my expectations. Everyone should experience this at a least once in their life. Thank you, thank you! Absolutely amazing week aboard Altesse. Fabulous boat!!! The best catamaran in the islands. Staff were phenomenal! Captain Richard answer all our 700 questions and Sarah's food was top notch. Gourmet meals three times a day, each one better than the last. Had an amazing trip. Already planning our next adventure aboard. Thank you. Charter was awesome and the trip was great! Great yacht for 6-8 people and our crew was simply amazing! All the water toys were included and the BVIs are amazing. Rich & Sarah could not have been more professional! They were great and handled our every request. I would highly recommend Rich & Sarah. They worked hard 24/7 to ensure our satisfaction. 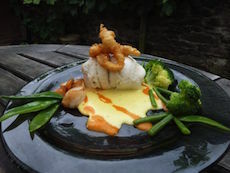 Sarah prepared the meals perfectly – food was well balanced and great selection. Thanks for a truly extraordinary and memorable week. We couldn't have conceived of a more perfect vacation/50th birthday and anniversary celebration with our dearest friends. You two are the perfect team - a phenomenal marriage of grace, energy and exceptional capability. From Sarah's 5 star cookery; Captains cocktail hour and itinerary to Richard's handling of the yacht; dive mastery; and your combined tour guiding, there simply aren't enough superlatives to capture all the perfect moments. Your home - Altesse - stands by herself: gorgeous and enormous, and your neighborhood - the BVI - what a match! It was a pleasure and a privilege to get to know you and share the week. You guys are awesome and no doubt our paths will cross again! This boat is like the presidential suite at the world's finest hotel. The food similar to a 5 star restaurant, it's every single meal exceeding all of our expectations. The planning of the itinerary and the sailing felt like we were guided by locals who knew the greatest treasures of the land. But we have learned that the best and most special part of life are the people you meet along the way. Sarah and Rich, you are special, kind, generous, professional, outgoing knowledgeable and willing to go the extra mile. This trip was fabulous, but extra-special as we were so fortunate to spend our time with the two of you. Thank you for making us feel as if we were at home. Sarah, thank you for being such fun and feeding us with exquisite dishes. Rich, thank you for all your guidance for the scuba team and for helping sailors enjoy the sailing. We are coming back next year, so we will not say 'adios', we will say 'hasta luego'. All of the amazing meals will be greatly missed next week when we are home, as will Richard and his ability to always find the best anchorages. You were both so willing to accommodate our every whim.We will miss the most amazing turquoise water, white sand and spacious boat we could imagine.You are both, without question, deserving of the "crew of the year" award and we are so glad it was you who were at the helm. Richard and Sarah, what a great week! I think I speak for the entire group when I say this was the best vacation ever. We loved the incredible snorkeling with beautiful fish, coral, turtles and rays; We loved the pristine beaches, with us often as the only inhabitants; We loved the hiking and indescribable views; We loved our daily briefs, discussing the itinerary for the day and awaiting the menu to see what each meal was for the day. ; We loved how beautiful and immaculate you kept the boat; and we especially loved Captains cocktail hour and hearing about your travel and adventures, with your knowledge of the BVI making our trip; and finally, the meals....OMG! It is impossible to pick a favourite meal as each was so special on its own. 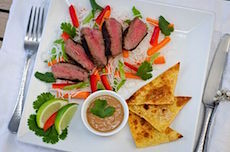 We are in great awe of the skills you show creating three gourmet meals (plus evening "nibbles") every day. It's hard to review the Altesse if only because we don't want anyone else to know how great it is!! But here's what I thought: The Altesse was literally immaculate. Richard and Sarah take real pride in maintaining it perfectly everyday- it was extremely conducive to a diverse array of preferences and activities with plenty to do. A serious highlight of the trip was that Sarah's an incredible chef. The food was perfectly tailored to our preferences with no effort spared and each dish was total perfection- I'm talking about picture worthy food! Even Richard pitched in on the grill a couple times and it was fantastic. Richard is incredibly knowledgeable about the area and just sailing in general- he has great ideas about anchorages,and takes pride in taking folks to places he thinks they'll love-he taught us to water ski-makes great pain killers and has some great stories! There really is no describing how perfect it was- and I can't imagine that there's a better crew or even a better pair of humans to spend your vacation with than Sarah and Richard Bowman. Thanks for a great week aboard Altesse! Highlights for this group included fun games for the kids, lounging and jumping of the champagne deck, tubing and paddle board surfing, teenage dinghy driving, the "miracle" of the watermaker and of course the daily institution of captains cocktail hour. The food was Unquestionably the best we have had in the BVIs. Sarah incorporated all our food preferences, preparing meals that appealed to adults as well as kids, including homemade ice cream and an astounding Christmas Dinner complete with a whole roasted turkey and no fewer than seven sides. There are no words for how amazing this trip and you both were. Every day you surprised us with something even more incredible. By far the best trip of my life! Thank you for everything"
What an amazing experience. Your lovely hospitality, personalities, food, organization,patience and story of your life shared with us will be cherished in my heart! Really appreciate you two as hosts and feel blessed to have such an amazing team/couple to look after us. Hope to cross paths again in the future, on a boat, on an island, email, worldwide web or however the universe decides to reconnect us. The experience we've had with you both in the middle of paradise has been amazing.We are in no way ready to go home! Thank you for sharing your home and making our experience truly unforgettable." "We had the week of our lives, this week in paradise! Sarah and Rich, made our holiday extraordinary!! We don't know how we are going to go back to life without nibbles and captain's cocktail hour All the food was fabulous and better than we could have ever imagined, whilst the other tourists were envious of our personal tour guides and champagne on the beach. Words are not enough to thank you for making our trip so special." We came here for a family celebration and ended up with two new friends! Thank you for your attention, kindness, patience, professionalism, wit and humour, you work so well together. The baths was one of our best days ever." I just wanted to thank you guys for the amazing experience which words cannot describe or do justice to. I've been blessed to see the things you've shown me this week and thank you so much for going the extra mile...simply incredible is what comes to mind." Thank you so much for the amazing sailing trip. You two are a wonderful crew and I know I'm not just speaking for myself when I say I had an absolutely fabulous time. I'm so happy to share Christmas and this week with you, this will go down as a once in a lifetime trip! Thank you again." "Richard and Sarah, you are lovely! The trip has been stunning, we leave sadly, but with incredible memories: my first dive, a huge pod of dolphins to squeal about, gorgeous meals, yummy drinks, huge smiles and sun kissed skin. Thank you from the bottom of my heart." We just wanted to reiterate how much gratitude we have for you guys after suchan amazing week. We truly think of you as inspiring and we are reevaluating how we want to spend our lives now that you have shown us a snippet of yours. Thank you so much for the best week of our lives. We truly hope you will have us back someday." First of all,the charter was amazing. The boat was incredible and beautifully maintained. It was such a lovely yacht, and it truly stood out among all the other boats on the Caribbean. Richard and Sarah were a wonderful team and were extremely gracious and accommodating of our family of 5. Sarah is a phenomenal cook. It is astounding what she can whip up in that tiny kitchen. 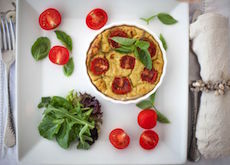 Every meal was superb, and Sarah was very perceptive and thoughtful about her food preparation, taking care to include or exclude certain ingredients depending onthe person including a picky vegetarian! 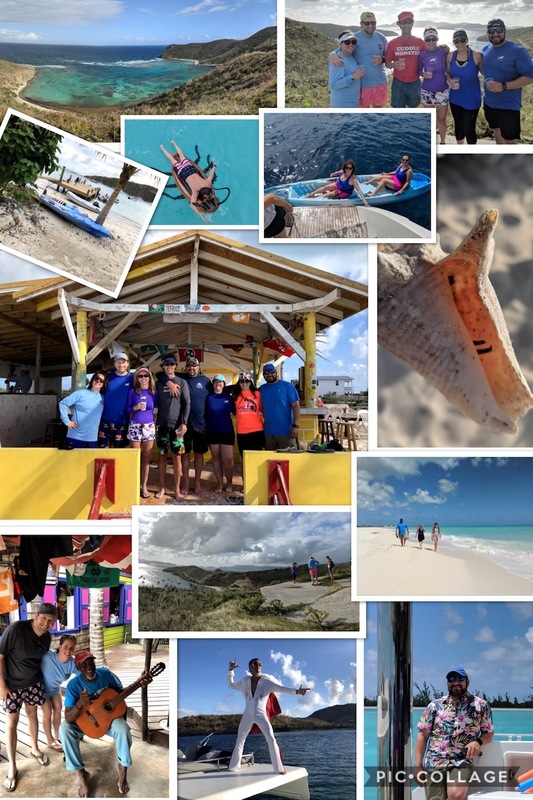 The sights that we saw were breathtaking, and Richard and Sarah took care to cater to our family’s special requests of finding more private beaches and spending many hours tubing and pulling the paddleboard for the kids (ages 14, 12 and 10). Richard even made extra stops for fuel to support these activities. The scuba opportunities were also incredible and my husband and daughter were able to take 3 separate dives during the trip. We could literally do most anything that was possible, and with the paradise-like backdrop, it was an ideal family vacation. We all thoroughly enjoyed ourselves even me, the self-proclaimed land animal. Even I couldn’t resist jumping in that gorgeous water at any opportunity. This trip truly offers something for everyone. 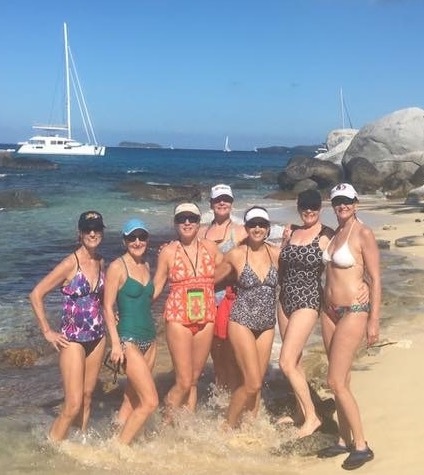 We would certainly sail again with Richard and Sarah, and look forward to visiting the British Virgin Islands in the(hopefully) not so distant future :) I highly recommend this charter!"